The University of the Ryukyus is one of the national universities in Japan, and the only national university on Okinawa. 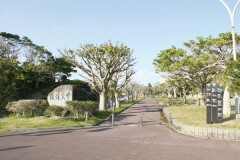 Its campus located mainly in Nishihara Town, but it has facilities in Kitanakagusuku Village and Ginowan City, too. Its Nishihara campus area is huge. The first campus of the university was built in 1950 at the site of the Shuri Castle, because the castle had been destroyed in the WWII. It was moved to its current location in 1984 because of the Shuri Castle restoration project.